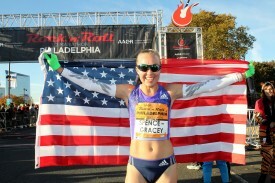 PHILADELPHIA – August 5, 2016 – American long distance runner Neely Spence Gracey is set to compete at the 2016 AACR Rock ‘n’ Roll Philadelphia Half Marathon on Sunday, September 18, 2016. Gracey is using the race as a training run for the 2016 TCS New York City Marathon. Neely Spence Gracey made her marathon debut in 2016 at the Boston Marathon where she was a top American competitor, finishing ninth with a time of 2:35:00. She has raced three Rock ‘n’ Roll Marathon Series events, including New Orleans and Chicago where she placed first as well as Philadelphia in 2015 where she finished third. Long distance running runs in Gracey’s genes. Her father Steve competed in the 1992 Olympics in Barcelona and placed third at the 1991 World Championships. AACR Rock ‘n’ Roll Philadelphia will run for its 39th year in 2016 and returns to its traditional mid-September date. The storied event is known for live bands and fanfare, entertaining participants along the course. Five World Records and three American records have been sealed at this race. After a one-year hiatus, race weekend will feature two-days of running. The AACR Rock ‘n’ Roll 5K returns this year on Saturday, September 17 at 7:30 am and will start and finish in Eakins Oval, Fairmount Park. Participants who run both the 5K and the half marathon will earn the coveted Remix Challenge Medal in addition to each race’s finisher medal. The half-marathon will take place on Sunday, September 18 at 7:30 a.m. The course will start and finish in Eakins Oval, Fairmount Park and participants will experience historic and cultural sites including, City Hall, the LOVE sculpture, Boathouse Row, Schuylkill River, Eastern State Penitentiary and more. In true Rock ‘n’ Roll fashion, live bands, enthusiastic cheerleaders and spectators will line the race route, concluding with a celebratory finish line festival and post race Toyota Rock ‘n’ Roll Concert Series headlined by Guster. American Association for Cancer Research is the race’s charity title sponsor. The AACR is the first and largest cancer research organization in the world, bringing together the greatest minds in cancer research in the quest to cure and prevent cancer through research, education, communication, and collaboration. The AACR is known throughout the cancer research community as a catalyst to propel the advancement of cancer research and improve patient care by convening and collaborating with the public, physicians, researchers, academia, advocacy organizations, industry, government, and scientific societies. The American Association for Cancer Research (AACR) Rock ‘n’ Roll Philadelphia Half Marathon will take place the weekend of September 17 – 18, 2016. One of the world’s most prestigious road races, the AACR Rock ‘n’ Roll Philadelphia Half Marathon is the home of five world records, five American records and the current men’s and women’s U.S. all-comers’ records. The race will give runners a first-class tour of Philadelphia and will start and finish in Eakins Oval, Fairmount Park. Participants can rock to the sounds of live entertainment along with enthusiastic cheerleaders along the course. Event weekend kicks off with a free Health & Fitness Expo at the Pennsylvania Convention Center on Friday, September 16, and Saturday, September 17. The Expo will have numerous vendors featuring the latest in running gear, nutrition and training tips. For more information, visit RunRocknRoll.com or follow @RunRocknRoll on Twitter.